Carrying on the weekend review, plumbers were in last week to fitoff taps (internal & external), waste plumbing etc. First; the kitchen. 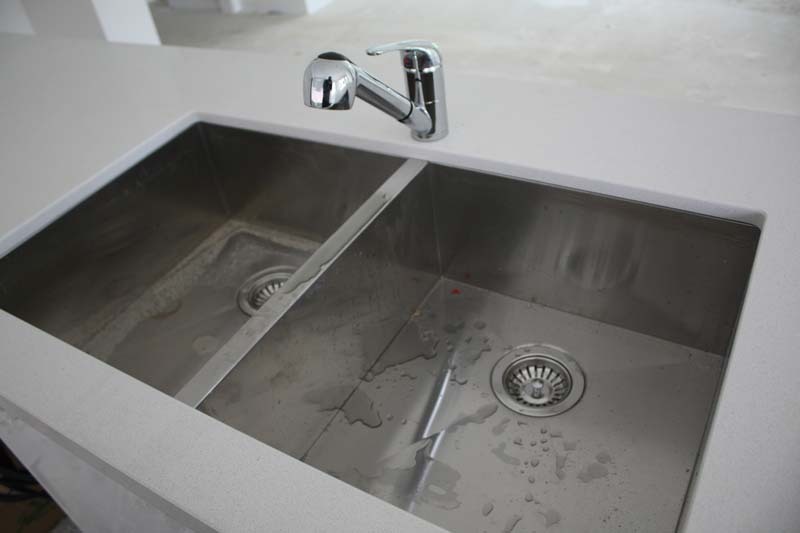 The Clark Razor sinks have had the drainage installed, and each sink has a basket waste - cool! The tap is an upgrade; Dorf pull-out vegie sprayer with mixer tap. To be honest it doesn't pull out as far as we thought it would (but then again, the sinks are much larger than normal) so for a normal sized sink, it'd probably be sufficient. We'll live with this for a while, but are already considering changing it for a commercial style overhanging sprayer...maybe! 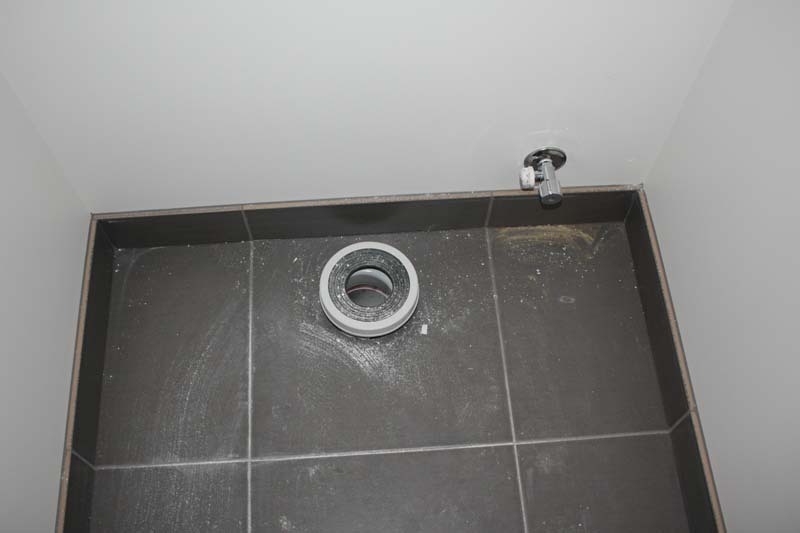 Next pic; details of powder room plumbing. Taps are the standard mixer, can't remember if they have a name, but nice and modern. Upstairs WC: Toilet waste has some special sealing cap around it, and the water supply to the cistern has been fitted off. 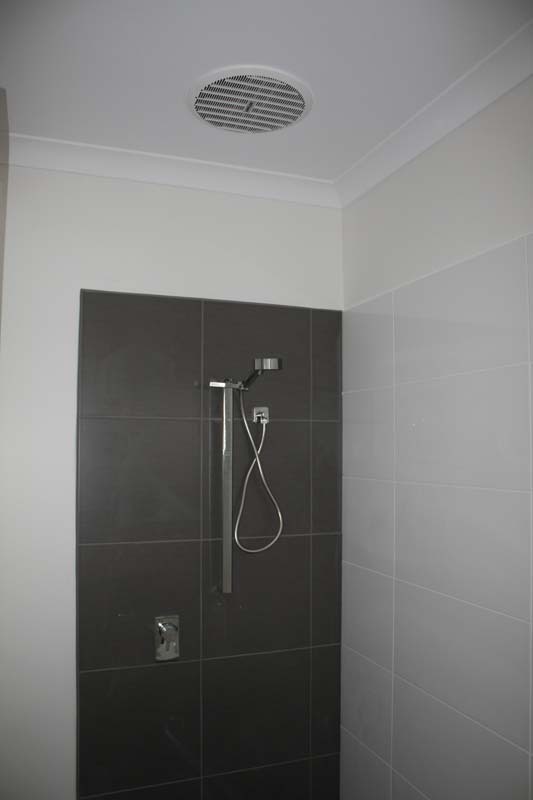 Bathroom: standard rail shower with mixer. Looks like the showerhead has 2 or 3 settings on it, and the square rail looks suitably modern, with the chrome finish a nice contrast against the grey tiles. Final pic, some details in the ensuite. 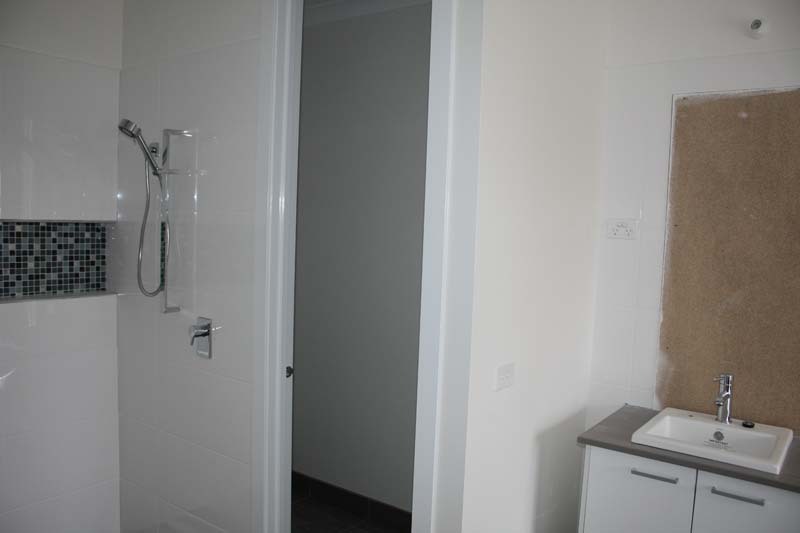 There's a wall-mounted rail showerhead on one side of the ensuite shower, and one rainfall showerhead from the ceiling which hasn't been fitted off yet. Then door the WC in the middle, and one of the ensuite sinks on the right. 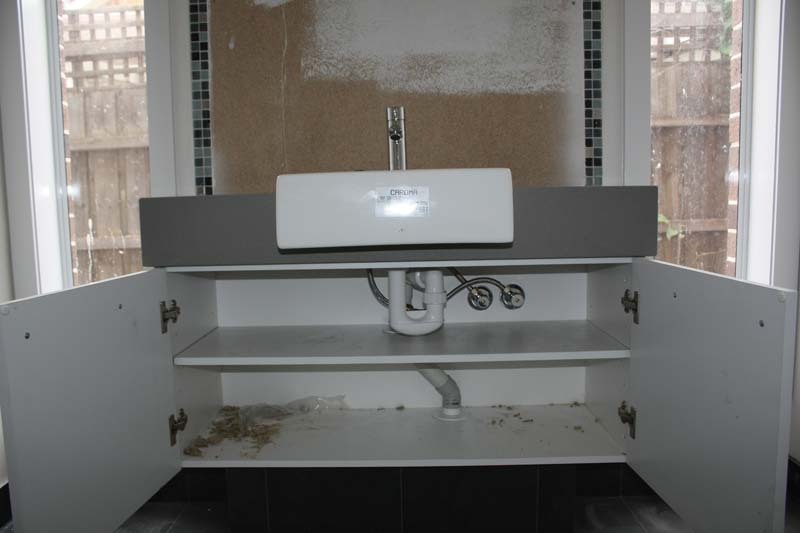 You can also see the standard wall light fitting above the sink - there'll be one above each sink. So all the plumbing so far looks fine, can't really pick any faults with it. Though there's a few obvious areas missing grout or sealant, so we'll keep an eye on that. You should be able to adjust the reach of the mixer, by moving the weight that will be connected to the outlets hose. Looks really good guys and they have done a good job with the plumbing. The house is really looking great! I've been following your blog for some time now and we break ground in the next few weeks starting a Laguna 36 in Sydney. I've learnt so much thanks to reading blogs and am thankful for the detail you put into your posts! Interesting that you are having a wall mounted shower rail and an overhead rainfall also - I asked about this at Studio M and was told they don't offer it. Wasn't very happy with that answer and now I see they do indeed do it in Victoria I am even less impressed!! Might be emailng my CS person in the morning I think!! Good luck in the home straight, I look forward to continuing to follow the progress! Jay: Thanks for the tip about the mixer length, will check it out next time we're in the house. Shayne: Good luck with your build, Tina really liked the Laguna floorplan, was on our shortlist to build as well. The wall+ceiling shower we only managed to get done because we did a redesign of the ensuite to get a much larger shower than usual.